(CNS): The arrest of an official board member from the National Housing Development Trust is not the only action police have taken this week against what is said to be financial irregularities related to government’s affordable housing scheme in East End. The police have also temporarily closed the offices of government’s NHDT and taken the computers for forensic examination as part of the investigation into corruption and deception. The 59-year-old man who was arrested at his home in George Town yesterday has since been released on bail while the investigation continues but it is understood the enquiry is widening. The official, who was one of only three remaining members on the board after a string of resignations which have not yet been explained by government, is accused of abusing his position on the board relating to the sale of insurance policies to the buyers of the low cost government built homes. Police confirmed yesterday that he was arrested under the relatively new anti-corruption legislation as well as for deception offences. 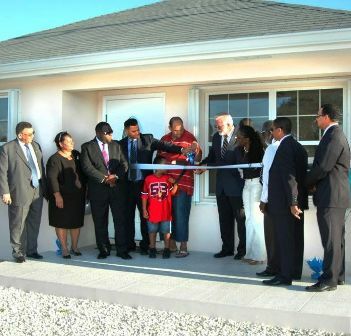 The arrest comes only days after keys were handed over to 12 families who have purchased homes on the East End project by government ministers and officials at a special ceremony. The East End development, which is now embroiled in controversy, is situated just behind the district’s primary school off John McLean Road. As charges have not yet been brought against the board member, who is also a member and director of the United Democratic Party, police have not named the individual. Although he is the first person to be arrested in connection with irregularities relating to the trust and the development of the affordable homes, it is understood he is not the only official currently under investigation. Following revelations by CNS on Monday afternoon that the board member had been arrested, Mike Adam, the government minister with responsibility for the NHDT, said that he was awaiting further details from the police commissioner about the arrest. Although Adam indicated that he was aware of the investigation, he said on Monday afternoon that he was unaware of who had been arrested and would be making an official comment once he knew more. Since then CNS has received no further commentfrom the minister or any government officials in the community affairs ministry, which deals with the government company. Government back bencher and general secretary of the UDP, Ellio Solomon, who has reportedly worked on the NHDT project, has also failed to offer any comment regarding the position of the party on the arrest of one of its leading members or his own involvement with the NHDT. 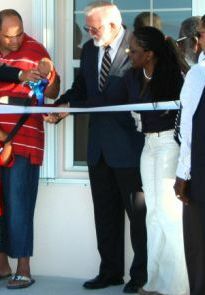 The investigation began as a result of complaints filed with law enforcement officials the police almost one year ago, which had accused government officials and political appointees of abusing their positions in regard to a number of different elements relating to the development of the one, two and three bedroom homes on the sub-division. The NHDT is a government owned company with a mandate to assist low-income Caymanian families and first time buyers into home ownership. There are several other housing projects underway across Grand Cayman, including the development of 29 homes in West Bay, 26 homes in Windsor Park in George Town and a project in Bodden Town, which is due to start shortly, but it is not clear yet if corruption investigations are also underway regarding other developments. How do we encourage the good and decent people to run for the district of West Bay? People like Bryan Bothwell, the Burke sons, Leonard Ebanks, Debbie Ebanks, Cora Grant, to name a few. These are the people who would make a real difference in the district, and leave no perceptions of corruption and who could be relied on to declare all personal interest if they have any. Doubt any conflicts would arise as I see them being honest and transparent and would not do anything that would tarnish their good names. Unfortunately, they probably don't want to get caught up in the madness of politics, but the district really needs a change. For clarity- not all enforcement agencies are under the Deputy Governor. Look at the NHIC, Pensions, Labour, Social Services and the list goes on. The ones mentioned ALL fall under a Minister. Can someone please correct me if I'm incorrect but, didn't something similar pertaining to government housing and Frank McField happen years ago as well? Irregularities or something? Or was that totally different. My memory is all blurred with the numerous black marks on the UDP (or anything affiliated with McKeeva) score board. CNS: You can read the auditor general's reports on the subject on the new OAG website in "Reports" – "Performance Audit Reports". No, you are absolutely correct. The AG found financial irregularities in the Affordable Housing Initiative involving the Minister for Community Services (2000-2005) and turned it over to the Police Financial Crimes Unit for investigation who sat on it for almost 4 years. 3 months before the 2009 elections they announced that there was "insufficient evidence" to press charges. The former Minister has since treated this as an exoneration. Is there any wonder that you find a similar situation recurring during the next UDP administration and why people lack confidence that anything will come of the current arrest? I recall that after the UDP won the elections in May 2009 and the Premier was sworn in, he announced in his inaugural address that the country was broke. What he was really trying to tell us was that when they are through with us in four years the country will be BROKEN. What I see happening …. we were so broke that they stopped the building of the ramp at the Bodden Town public beach, now that elections are "soon come", the ramp is being built. we were so broke that the high schools were a bad idea, now the schools are needed and new reception classes are built, all with new equipment which has already been purchased (at West Bay JACPS). At the next session of the legislative assembly I will be standingat the front door handing out adult diapers to some of the guys. Hope you are not paying for them – nation building fund!! When the Governor wascoming to cayman i am sure he expected blue skies and to live on calm seven mile beach with a beautilful sunset, I doubt he came expecting our little island to be in such madness, I am sure the poor man is too dumb-founded toknow what to do! And we also need an insane asylum for people like you. I believe this government will leave a crimson stain on the ledgers of history. At least they will go down in history for something. More likely they are leaving signposts on the pathway described in the ledger of history. They will be seen to have read “Now Leaving Success”, “Beware! Failure Ahead”, and the big one: “This Is Where Cayman Failed”. I’m sad to say that I don’t see Cayman bouncing back from this. They’ve wreaked it all. In the past I have heard Ellio ranting and raving on one of the local early morning talk show about the PPM and their mis-management as he perceived it. Presently he has gone ghostly quiet. I cannot help but wonder why. If more than ever- we need 15 INDEPENDENTS to win the next election. Party politics the past 10 years have been the ruination and destruction of this lil rock in the Caribbean. No government department and/or government board should be appointed by any elected government, All Government departments- especially those with law enforcement capability MUST be placed under the Chief Secretary, now the Deputy Governor. the same goes for Boards. This madness needs to stop!!!!! You will need 18 GOOD, real, independents. Last time there were many independents who were simply not credible or were not really independents. Law enforcement depts are all under the Deputy Governor. 11:08 One thing I know for sure Bodden Town will be making a clean sweep. By what I am hearing it seems that the UDP will be loosing their seat up here including the PPM member. I do not think the district of Bodden Town will be voting in any of the old fowls either, because they had their opportunity and did nothing beside complain that their hands were tied from making progress and achievements in Bodden Town. Bodden Town not only wants fresh Blood,…….. we need fresh blood, new breed of intelligent people with great ideas who are not afraid to stand up for what they believe in. We are looking for Members and ministers who will not undermine the people of the district, people who will see to it that the MLA office is where the people can find it. We are looking for people who will make sure that progress is made in this district and young people are encouraged to get work. We are looking for people who will make sure that the seniors are well looked after. We are looking for people who will encourage businesses to open branches in the district. We do not want people who is a big promise until after they are voted in, you dont see them you dont hear them and wonder if they are still on the Island. Every district has theopportunity to do what is right, but I know one thing for sure BT will make a changes. We complain so much, and expect much more. When we had representatives who were active and helping, we were still complaining. Now we have the best representatives who looked out for our best interest, so they gave us the garabage dump. Why are you complaining, when it was said that Bodden Town was the best place for it. That is what we got from our UDP government. Could we expect any better from our representatives. Wait until 2013 and you will see how many will remember the wonderful representation that the BT district got. When the envelopes arrive in the hired cars everybody will be smiling on their way to the polls. 18:32 I believe the prophet can be opinionated on this one. Putting the garbage dump in Bodden Town, has nothing to do with the poor representation Bodden Town are getting or the poorer representation they have had. Of course any fool would realize the dump had to go somewhere. Well if Bodden Town has the space/area, and a Caymanian was given a big chunk of change why bother. I always say if the dish is not broken it dont need fixing. It is poor representation now and has been is tghe problem not the dump. ….and we are looking for people to be duly elected. All the warnings in the past given to the UDP ministers to stand up when things are not right and speak up or come out in the open against the XXXX may now turn out to be : " Guilty by association". Very sorry for one of it's member and hope that he will come out clean. This morning on Rooster was Arden McLean NOT Alden McLaughlin. Ellio better not mess with the action man. He is an upstart, but he better know who to stay clear off. OOh God here we go again. Can they not even do a bathroom run without breaking some law? Just let's hope now that for once something comes of all of this and it is not just simply going to fizzle away again…………..
best be prepared for a fizzle. history ya know. Friday morninsg Rooster talk show usually features Ellio & another UDP member. I Can't wait to hear the spin that Ellio uses then. Please Ellio don't bail out like Mike did on the TV saying he can't comment while investions are ongoing because we know Ellio always has a comment! If I was interested in running for political office in Cayman and I was a gambling man, I would say now is the time for honest, educated, upstanding individuals to come forward and declare themselves. I think the public is now ready for change. I think its time for me to announce my intention to take back our country! Good 08:52 If you think it's time for you to announce your good intentions, It would be great to risk putting your name as you are not the only one and we could take it from there. It's a real shame that we still feel intimidated as to have to hide who we are! hopefully that too will change. BTW, How can you run for office and be a gambling man in Cayman? Enquiring minds want to know?! To Ace in the Sleeve. Read the post carefully. The writer prefaced the post with "If…." interested and (plus) a gambling man…". The writer may be interested but not a gambling man… hence the hesitation in deciding? I bet some people are experiencing a few jumpy days and restless nights. If you notice anyone acting that way, then please report it to Mr. Baines at once. Innocent people who have families to support, mortgages to pay and mouths to feed…..
Why would they be jumpy if they are innocent? probably because we don't know what tatters our country and economy will be in if something isn't done fast – its enough to make anyone nervous and jumpy! I thought it was sarcasm meaning the average innocent person in the community struggling to make ends meet with exorbitant light bills and such who is jumpy because of fret. My children often say that if you have to explain the joke, it doesn't end up being funny. I guess we will hear soon that the new "Govt Administration Building" is shut down by the RCIPS and following that, an order of new lawsuits will be filed in our courts against the C.I. Govt. Isn't it absolutely amazing what the Cayman Islands has become in the last 5 – 6 years ?? Certainly not for the better………… in so many respects !!! I'd agree with that comment had you said in the "last 2 years". Maybe it was Bush about the Stan Thomas case. If not he should follow the other man's example. None of this is helping Cayman's reputation. I do believe this will be the nail in the coffin in costing the UDP Government the next election. The time for independant minds running for office and forming a proper coalition that can work for a better Cayman is what we need!! Thought I heard someone yell "key card"! Bravo, the UDP now has a bright future! Stll waiting on Mr. Ellio's press? Where is Mr. Solomon's statement? Today is Tuesday and not a squeak. Where is the rat trap? Maybe he is afraid to open his mouth because Alden McPacquio has not yet left the room? Corruption must NOT be allowed to flourish anywhere in Cayman. Once it is allowed to take root, it could take many generations to remove it. Anyone tried and found guilty of corruption should be punished to the fullest extent of the law. It has already taken root. And in the highest places. What we need to do now is weed the garden. Pulling the coruption out by the roots and leaving the paradise we used to know. I hope this is the star of that. Right on, Anonymous 8:14! Now…… Can we depend on the Governor to take part in the weeding? I certainly hope so. What say ye, Governor? Isn't it sad that the anti corruption law was not retroactive! Then we would see the real skeletons come out the closets! Agreed, it is good to see this new law acted upon immediately. Some people have no soul, taking advantage of people who are trying to help themselves, shame on you. I gave a reply of thumbs up to the general statement of shame on anyone who takes advantage of people trying to help themselves but them realized that we have to be careful HOW they help themselves and also have to consider the most important "A man is innocent until proven guilty.". Seems to me it has been going on for quite some time but things are now coming to light. That's because ordinary people do not like what is happening and are now speaking up without fear. We need more courageous whistleblowers to step up and do the same thing for the good of their country. Tolerate no corruption in ANY form and from NO ONE, no matter who they are.